Washing machines are a household necessity when it comes to cleaning, but when they malfunction, break, and cause a flood, they can be a nightmare to deal with. Although this is an uncommon for the average homeowner, Abbotts remediates washing machine floods on a weekly basis. Flooding while usually unexpected, can not only ruin our schedules and plans but more importantly our homes. Abbotts Fire and Flood professionals are skilled in addressing water damage emergencies like washing machine floods. If floods are not acted upon quickly and with expert care, they can result in increased damage to floors, carpets, furniture, building structure, etc. Floods can also cause mold and mildew unless proper procedures are used to dry out the property. Water damage should be handled by experts like Abbotts, who utilize air movers, HEPA air filtration systems, and industrial grade dehumidifiers for an efficient cleanup and successful restoration. 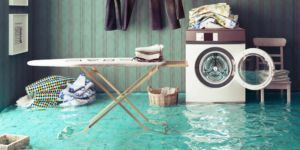 Restoring your home after flooding caused by a washing machine overflow requires unique and expert attention. Unlike broken water pipes within walls or a sewer backup or overflowed toilet, water from a washing machine is “in-between” water, meaning it’s not sewage water or potable drinking water. This “grey” water can cause discomfort if consumed by humans. To ensure your property has been properly sanitized and dried, it’s important that the company you choose to restore your property uses guidelines set forth by organizations such as the New York Standard for Mold Remediation, the EPA and the IICRC Institute for Cleaning. 1. Stop the water flow from causing further damage. Shut off the main water valve if you cannot locate the supply line where the washer line attaches to the wall. 2. Call Abbotts Fire & Flood for water extraction and to start the process of drying or get started on the quick drying process yourself. Our expertise in water extraction means we will quickly and carefully detect visible and not visible areas where water may have penetrated, i.e. insulation in the walls, within cabinets, crawlspaces, under flooring, etc. 3. Dry any items that can be saved and remove those that cannot. If you are not sure about an item or fixture, we will assess this for you. Furthermore, there are exceptions to Category 2 damage (which this falls into), which means that items like carpeting can typically be dried in place, but carpet padding should be removed and replaced. 4. Monitor moisture levels and drying equipment daily until structure and contents are dried. Dry, warm air must be present to pull moisture from the contents and the structure. Abbotts Fire and Flood will use moisture detection equipment to ensure dryness levels. 5. Understand why the flood occurred and correct to prevent future occurrences. Your washing machine may be ready for replacement or perhaps it was something else? 6. Rebuild and repair necessary areas. Abbotts Fire and Flood or our partner will do this work with an eye towards keeping the construction costs as low as possible and furthermore, partner with your insurance company to make the process easier for you. Our team would like to help you address your water damage emergencies as fast as possible, so we are available 24 hours a day, 7 days a week. For a timely and quality restoration job, trust Abbotts and call us today!